V11 Smart Watch is a multifunctional watch which can not only be a Fitness tracker, but also can be a smart call-and-message reminder. It can connect your mobile phone and unlock your phone screen directly. When you have a phone call and not answer in time, it will automatically shake you to remind you. 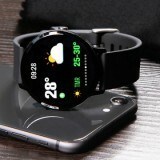 When you first see this watch, you will like the appearance with 1.3 inch resolution 240 x 240 large single touchable glass screen. Besides, it can forecast the weather to remind you wear more cloth and bring an umbrella. With this watch, you will fall in love with sports even if you hate it before. It has a variety of sports modes to peek your interests to do sports. 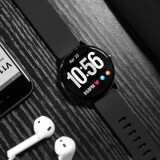 What’s more, there are also other entertaining functions, such as sports record, track map, sleep monitoring, sedentary reminder, calories, hand-up to light the screen, fast charging, heart rate monitor, blood pressure test, remote photography, music and smart alarm, you can do almost everything with this watch. Do not worry about the watchbands, it can be replaced with your own style. Just get this amazing watch! •Other entertaining functions like sleep monitoring, remote photography and and etc. 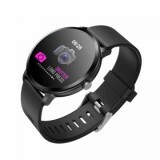 • Other smart watch are also available in BuyBest. This is my first fitness tracker but I believe it can do everything hat a more expensive tracker can do. The best feature for me is the heart rate monitor which I think is very accurate. I like that the app shows an average of your heart rate as well as your resting heart rate. I am also able to use the running or biking function for my workouts and look back at the time I’ve worked out and my heart rate. The design is simple and fashionable. I also find the band to be very comfortable while tracking my sleep. it's amazing watch and strap soft, arrived a week earlier than expected. When the phone has a WhatsApp or Facebook message, the watch will vibrate and flash green light... You can also read the complete text. You can control the camera and the audio player of the phone, today I took a shower and had no problem. After fully charged, it can be used for 5 days. It has three time screens to choose, best precise activity tracker, and many other features. .. I am shocked at how well this works for the price I paid. I wasn't sure it would hold up with my water aerobics but it is totally waterproof. I have very small wrists so the band is as tight as I can get it. It is a little slow to wake up when I finger slide the mode switch. I have to do it several times to wake it up. It paired well with my phone and the app gives me the info of all my activity, sleep and heart rate. Good value!!!!! Good watch, very much. 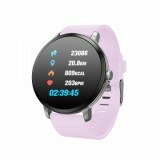 Display bright and very colorful, all functions work, the question of course how well… WITH phone connected easily through the program Da Fit. By the way the program is simple and convenient, through it and update the firmware to the latest version. Will be delivered in a month. Oddly enough daehali with charge in 65%. As far as keeping the battery is difficult to say one day dead half, but it is a very active use. Great seller, you can solve any question. My 10 year old son loves this thing. I was hesitant to purchase because I felt it was very expensive for a child. I love the free app that allows us to track his progress as well as establish chores and rewards. Makes it a little easier to get some help around the house lol. I'd highly recommend this product to anyone with a smaller child. Its water resistant, he never takes it off. I got this tracker as a present for my husband, he has been using it for a couple of days and he just loves it! He wears it everyday without any issue, it’s really comfortable and stylish. We exercise together and the functions it has help you track your routine, specially the steps counter; besides that, the heart rate, oxygen level and blood pressure are really helpful functions to check on your health. Professional Fitness Tracker: Not only a watch, it can also use as a Heart Rate Monitor, Sleep Monitor, Step/ Distance/Calories Counter, Sedentary Reminder, Call& SMS Reminder, Camera& Music Controller, etc. Download APP named “Wearhealth” to save and sync the data to achieve your healthy goal! All these functions are wrist-based and easy to use. 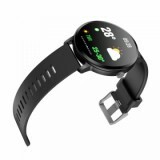 Smart Reminders - Wider Compatible with iPhone Android, use smart synchronous push function, lets you see Calls & Messages on the smart watch, it'll vibrate to remind you of the incoming calls, SMS and SNS contents (Facebook, WhatsApp, Line) notifications on display, never misses important issues while in the meeting or bathing. Never miss important issues while in the meeting or bathing, excellent life smart assistant. t isn't an apple watch but you knew that. It doesn't have more features than you need but that is what allows it to have a great battery life and not look like a huge gadget on your wrist. I have had it a week and really like it. 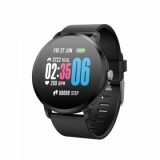 V11 smart watch is excellent fitness smart watch, daughter bought 11 years, sit well, function complete, even oxygen in blood measures, actually a great product. 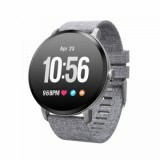 Great fitness watch! This watch is very durable. It's water proof and very stylish. The band on this watch will fit someone with a larger wrist and also someone with a smaller wrist. Great fitness watch for swimmers as well because it is waterproof.